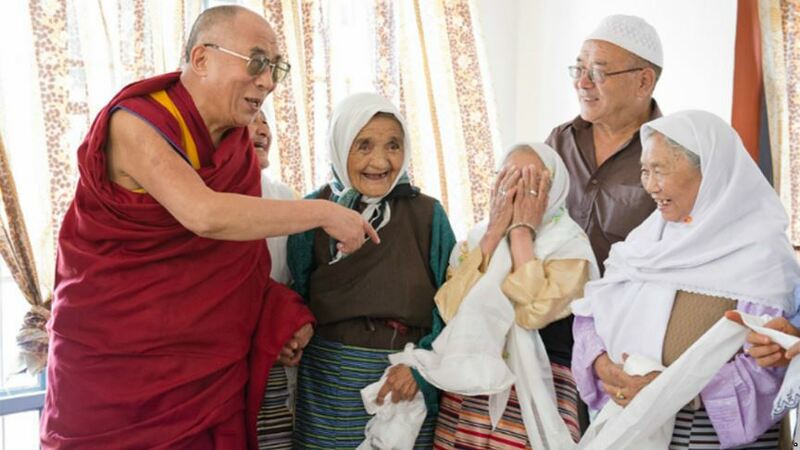 The Dalai Lama with Tibetan Muslims. Photo: Voice of America. The Dalai Lama first met with the Srinagar Tibetan Muslim community in 1975 and later again in 1988 and has continued to keep in touch with the situation of Tibetan Muslims who have a distinct identity as both Kashmiri and Tibetan. Here’s the situation: one bureau in the US Department of State condemns a foreign government for committing human rights atrocities against cultural and religious minorities. Another State Department bureau officially recognizes that same foreign government’s control over the cultural heritage of the same persecuted religious minorities. How does this make sense? The question is raised by the proposed renewal of a cultural property agreement with China set for early May 2018 – an agreement premised on the idea that US Customs controls can help to prevent looting in China. The proposition that China needs US help because it cannot police its own people or control its art market, the largest in the world… that is a subject for another day. 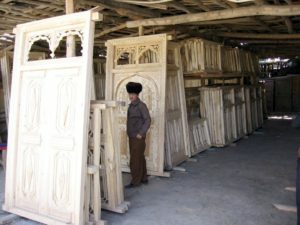 Reports from China about government persecutions of Chinese Christians, Tibetan Buddhists, and Uyghur Muslim minorities are on the increase, but the signing of a US-China agreement on cultural heritage seems to be less about trade or looted artifacts, and more about the US promising a diplomatic “hands off” of both Chinese art markets and China’s repression of dissent. The issues are sharpened because this week is the anniversary of the 1959 failed uprising of the Tibetan people against Chinese occupation, and of the violent crackdown and decimating of Tibet’s governmental and religious institutions that followed. China’s suppression of religious and minority communities is not new – hostility to non-Han Chinese culture continues to be a powerful driver of internal policy in China. 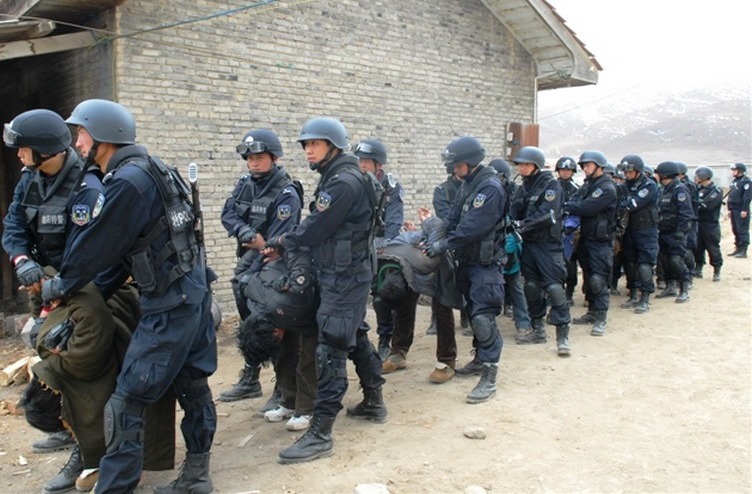 Military police have used explosives to demolish Christian churches, Chinese authorities bulldozed hundreds of dwellings in the Tibetan Buddhist sanctuary of Larung Gar, and tore down 5000 mosques in western China’s Xinjiang Province – all since 2016. Even before the Cultural Revolution, there has been overt state control of religious practices in China. The Communist Party of China (CPC) is by definition made up of atheists. The CPC has a mandate: to promote a unified socialist China in full alignment with the laws set forth by the party. While China’s state policy is officially “tolerant” of minority peoples, it does not really accept divergence from a Han Chinese norm. Contemporary expressions of diversity in cultural heritage are generally limited to celebrating folk customs of the types pleasing to tourists, particularly those incorporating pageantry and telegenic costuming. China watchers have expressed concern about the government’s present levels of religious intolerance. This includes the military police’s blowing up unregistered churches and removing crosses even from officially registered churches, punishing expressions of minority and indigenous identity with imprisonment, and imposing harsh penalties on law-abiding citizens for traditional customs (for example, refusing access to public transportation and social services to women who wear veils, or not allowing Muslim baby names to be registered). In recent months, there has been increasing pressure on religious and indigenous minorities to conform, and violent or destructive incidents have increased in number. Despite the often cozy relationship between China and the US, China’s persecution of religious minorities caused the US Department of State, on December 22, 2017, to re-designate China as a “Country of Particular Concern” under the International Religious Freedom Act (IRFA), along with Burma, Iran, and North Korea. The official designation is for having “engaged in or tolerated systematic, ongoing and egregious violations of religious freedom.” This is the most severe designation under IRFA. Even Pakistan, where religious minorities are subject to frequent attacks and mass killings, has a less critical designation. There is an obvious contradiction between the Department of State’s designation of China’s government as systemically violating international norms of cultural tolerance, and the repeated renewal of US-China agreements on cultural property that grant China’s government absolute control over the same cultural heritage that it has sought to destroy. The marked increase in religious repression of China’s Uyghur Islamic, Protestant Christian, and Tibetan Buddhist populations since President Xi Jinping assumed office in 2012, should come as no surprise. He is a strongman who touts the party line. What is surprising is the increased public expression of these repressive actions after a lengthy period in which the Chinese government sought to soften its image by demonstrating at least conditional support for civil and religious liberties. However, it appears that “excellent traditional culture” with “Chinese characteristics,” excludes expressions that are not communist, and not Han Chinese. Religious expression that doesn’t meet the party norms is dealt with swiftly and often violently in China today. Officially, there are about 30 million Christians in China, but foreign observers believe there are tens of millions more. In January 2018, Chinese military police in Linfen, Shanxi Province used explosives to demolish the Golden Lampstand Church, an unregistered Protestant church said to have 50,000 members. Its congregants had undergone repeated prosecution since they broke ground on the building in 2009. Church members who have protested its destruction have suffered beatings, arrests, up to seven years’ imprisonment, and heavy fines for their devotion. This time, they could do nothing to prevent its complete demolition. This was not the first church deliberately destroyed by the Chinese government. In addition to the complete destruction of a number of church buildings, and the arrest of clergy and congregants who have been out of line with the CPC, there has also been a campaign since 2015 to remove crosses from the tops of church buildings in Zhejiang Province. To date, it’s estimated that over 1,200 crosses have been knocked down and forcibly removed. Christian churches are not the only religious buildings destroyed in the last few years. Radio Free Asia’s 2016 article entitled Under the Guise of Public Safety, China Demolishes Thousands of Mosques, described how over 5,000 mosques in the Xinjiang region (approximately 70% of all mosques) were destroyed in a three-month “Mosque Rectification” campaign. The official explanation was that the mosques were dilapidated and dangerous for worshipers, a claim met with either raucous laughter or disbelieving “silent stares” from locals when they were announced, according to Chinese government officials. Citing concerns about Islamic extremist’s activity, Beijing has been particularly hard on the Uyghur Islamic community through what they call “strike hard” campaigns. These have included random, nighttime police raids on Uyghur households and the repression of large portions of Islamic culture including banning women from wearing headscarves, limiting the length of men’s beards, preventing fasting on Ramadan, and restricting Islamic education for children. Surveillance is constant in Uyghur communities and smartphone use is frequently monitored. 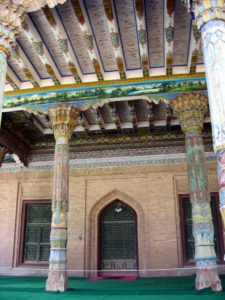 Apak Khoja Mosque, Kashgar. Author: Colegata. Wikimedia Commons. Tibet was forcibly joined to the People’s Republic of China under a document known as the Seventeen Point Agreement, which was signed in 1951. The Dalai Lama fled from Tibet in the wake of the Lhasa Uprising against a brutal Chinese occupation in 1959. On his arrival in India, the Dalai Lama repudiated the Seventeen Point Agreement, saying, “The consent of the Government was secured under duress and at the point of the bayonet.” The violent destruction of the monasteries beginning in the 1950s and the exodus of an estimated 100,000 Tibetans into India and Nepal after the 1959 uprising brought many thousands of artworks and artifacts into the Western market. Although today, Chinese sources generally describe the destruction of monasteries in Tibet as taking place during the bad old days of the Cultural Revolution, there was massive destruction earlier, especially in Lhasa, during the “democratic reforms” imposed after the March 1959 Tibetan uprising. (See, for example the appeal of the Dalai Lama to the United Nations on September 9, 1959.) The most common estimates for the reduction of the number of monasteries in Tibet show that there were about 2,700 in 1958. These were reduced to less than 400 by 1960, and further reduced, after the Cultural Revolution, to only eight. There is said to have been rebuilding of approximately 280 monasteries starting in the 1980s. However, there is not freedom of expression or religion in Tibet today, and monks and other religious persons are punished or arrested if they speak out against the Chinese government. Military Crackdown in Ngaba, TIbet, Date 30 November 2011, Author SFT HQ (Students for a Free Tibet). Wikimedia Commons. Tibetans who are free to speak – meaning those outside Tibet – have mixed feelings about the holding of Tibetan religious art and artifacts by foreigners. Some view such artworks as the property of the Tibetan people, and are wary of granting rights of possession to others. However, they seem agreed on one thing; these artworks and artifacts are better off outside of Chinese control. Many others support foreign holdings as the best way of safely conserving Tibetan art and encouraging scholarship on Tibetan history and religion. In part, this is due to the respect that has been shown to the cultural heritage of Tibet in its display in foreign museums and the understanding and appreciation of Tibetan culture generated by having uncensored public access to it. Museums with large Tibetan collections such as the Rubin Museum of Art in New York have cooperated extensively with representatives of the Tibetan community in exile. Other museums and institutions have welcomed the advice and scholarly contributions of Tibetan specialists. This writer was privileged to be present during the visit of the Dalai Lama at a meeting of an ancient art collector support group at the Los Angeles County Museum of Art in the 1980s. The Dalai Lama was shown the Tibetan collection at LACMA and spoke there of his appreciation for the collectors, of the importance of connecting peoples through the arts, and of safely preserving Tibetan cultural artifacts until it was possible for them to return to a free Tibet. 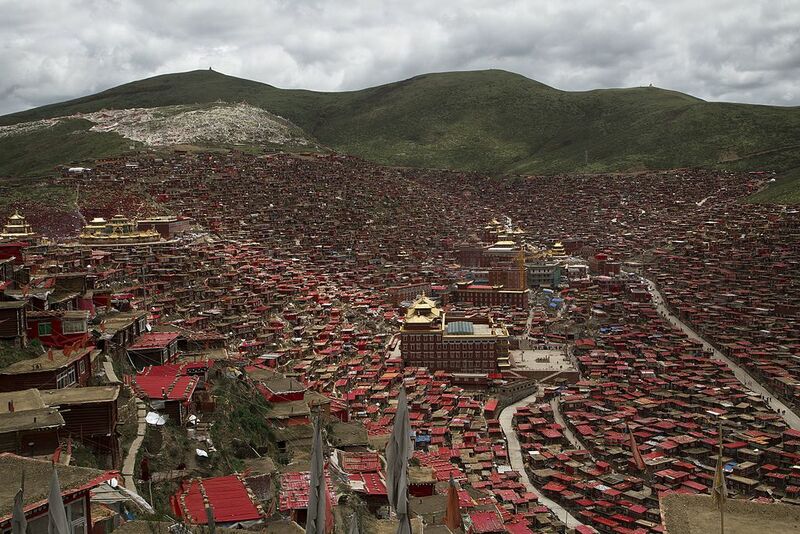 Larung Gar Five Sciences Buddhist Academy, 2014, Author Boddhicita, from Chung Du Shi, China. Wikimedia Commons. In late January 2018, Human Rights Watch reported that the Chinese government is now poised to take over the administration of Larung Gar, dividing the monastery into two parts, an academy and a monastery, split by a wall. Communist Party officials will be placed into key administrative and financial positions. It is one thing to use history and culture to make propaganda. It is another to sacrifice human rights, freedom of speech and tolerance for diversity and dissent in order to secure a totalitarian government. Is it unconscionable for the US State Department’s Bureau of Education and Cultural Affairs to bind the US to cultural property agreements that ignore the devastating conclusions drawn by its Under Secretary for Civilian Security, Democracy, and Human Rights: that China is in egregious violation of the International Religious Freedom Act? Since 2009, China (and the Chinese art market, which is now the largest in the world) have benefited from protectionist trade agreements with the US under the Cultural Property Implementation Act of 1983 (CPIA). These prevent the import of most Chinese art into the US and grant a virtual monopoly to Chinese art auction houses (which often have close government ties) while damaging US business, collector, and museum interests. A US-China bilateral agreement under the CPIA, known as a Memorandum of Understanding or MOU, was established by executive order in 2009 and renewed in 2014. The most recent US-China MOU covers virtually everything Chinese (inclusive of Tibet and other so-called autonomous regions) “up to the Tang dynasty” (up to 970 AD) plus “monumental sculpture and wall art up to 250 years of age.” The most recent Designated Lists of items prohibited from import into the US was published in the Federal Register in 2014. Note that in the Designated List, “sculpture in the round” is covered on rolling dates through the Qing period (from 1644 to 1912). Given the 250-year limit, this material is now covered up to 1758. 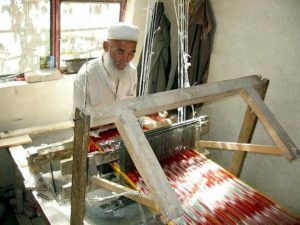 A weaver in Khotan working at the loom on a silk warp ikat fabric, a traditional technique in which warps are dyed in patterns prior to weaving. Author: Colegota. Wikimedia Commons. The United States has an opportunity to send a message to China about respect for human rights through its decision on an agreement under the Cultural Property Implementation Act this May. These agreements, which become in reality blockades on the entry of foreign art into the US, are often seen as a means of protecting countries with weak law enforcement and few resources from the depredations of archaeological looters. That hardly describes China. It is a wealthy and powerful nation with virtually unlimited control over its citizens. (D) that import restrictions are consistent with the general interest of the international community in the interchange of cultural property among nations for scientific, cultural, and educational purposes. China has more than adequate enforcement resources: China’s government can control its people and does not need to have the US act as a distant international policeman. China has never shown that the agreement’s barrier to US import of Chinese art has any effect on discouraging looting in China. China has a billion-dollar annual internal market in art of all periods that includes the same kinds of antiques barred from US import. The United States is no longer a primary market nation; it has had a net outflow of Chinese art for the last decade, Thousands of US-owned antique objects have left the US – destined for China itself. In making public policy, the US government has often said that human rights are fundamental rights that they should not be minimized or disregarded because they conflict with temporary political goals. For decades, historians and academics have pointed out the dangers of treating ‘culture’ as at the service of the state. The reports of political repression of religious minorities in China are a clear reminder that however brightly the opportunities of the 21st century shine, the lessons of the 20th century, in which totalitarian regimes defined ‘culture’ for the darkest of political purposes, ought not to be forgotten.